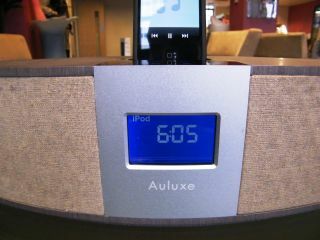 The Auluxe Reverie Casa made its debut at IFA 2010 this year and certainly stood out from the myriad other iPod docks shown off at the show. Its wood finish and the fact it has been made by hand meant that a lot of care and attention had been put into the product. TechRadar managed to get its hands on the first Reverie Casa in the UK this week and were impressed with what we both saw and heard. Auluxe hasn't been in the UK that long – only since the middle of 2010, but with products like the Reverie Casa the audio company is certainly making an impression. The dock's ellipse shape is pleasing on the eye but also makes the Reverie rather slim. The wood casing is solid and adds to the acoustics somewhat. The music we heard on the system – coming from an iPhone 4 – had a great earthy quality to it and even when it was cranked up to ear-splitting levels, there was little crackle or unwanted vibration. The bass, coming from the in-built 2 x 3-inch bass-mid range speakers was decent, and the 1-inch dome tweeters did a good job of managing the high frequencies. The great sound was definitely grounded by the solid wood casing. The controls of the Reverie Casa are flush with the top of the speaker system and touch sensitive. There were the obvious fingerprint markings after we used them, but they were responsive. Here you can change the volume, search for radio stations and change the mode you are on. When it came to radio we were impressed with the clear sound but it only has an FM tuner. For something that feels like a luxury product, we would have expected DAB functionality. The only other bugbear we have is the complete lack of remote. This smacks of a system that you would install in your kitchen or somewhere where it is in easy reach. The lack of a remote doesn't rule out putting the Reverie Casa in the living room, but having to get up to manually change volume and like on the device will be a gripe for some. Niggles aside, there is no denying that the Reverie Casa is a discerning bit of kit. It's lovely to look at, sounds great and, with a price tag of around £300, it's not totally out of reach price-wise for the everyday consumer. The Auluxe Reverie Casa has a UK release date of mid November and will be available initially from Marks & Spencer and Amazon.co.uk for £300.